A brand new feature called Waste Wizard, an application on the SOCRRA website, provides instructions on how to handle every type of material. Simply type the name of a waste item and it will tell you how to recycle or dispose of it. Access the Waste Wizard at https://www.socrra.org/. Download SOCCRA's press release regarding the Waste Wizard here. All SOCRRA communities participate in the mixed recycling program. Visit SOCRRA's website for more information. 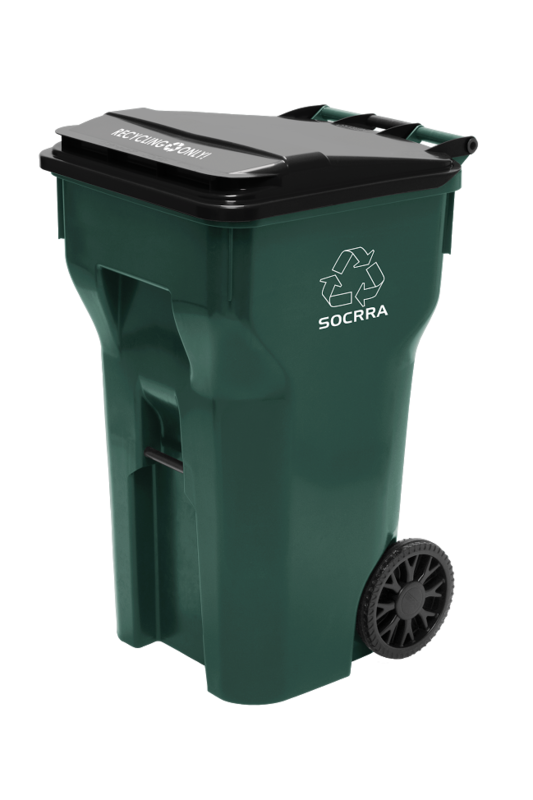 If you don't have a green cart, contact SOCRRA at 248-288-5150, to have a cart delivered. Mixed recycling is when all recyclables can be mixed together in both the recycling container and recycling truck. The sorting of materials is done at the MRF, rather than by the recycling drivers. Why the big green carts for recycling collection? Proven benefits of switching to carts include more recyclables collected, increased convenience for residents to fit all their recyclables into one container, increased safety for workers, and potential cost savings. More materials diverted for recycling will increase revenue sharing for member communities thereby reducing disposal costs. Please note: Household batteries (AA, AAA, D, C and 9 volt) will now need to be taken to the SOCRRA facility. Please do not put them in your recycling cart. Visit https://www.socrrarecycling.org/ for additional information. View our Curbside Recycling Guidelines to see what items to place in your recycle bin. View the Household Hazardous Waste Disposal Guide to see how to properly dispose of household hazardous waste and electronics which you cannot place in your recycle bin. Recycling is collected on the same day your trash is collected. Be sure to set out by 7:00 a.m. on the day of collection, and keep several feet between recyclables and other items out for collection such as trash and yard waste. Dual Refuse, Recycling & Compost Trucks. Car Trucking (the City's refuse hauler) has purchased several dual purpose trucks. These trucks have two separate sides which allow them to take either trash, recyclables or compost.